John Earl Madden (born April 10, 1936) is a former American football player in the National Football League, a former Super Bowl-winning head coach with the Oakland Raiders in the American Football League and later the NFL, and a former color commentator for NFL telecasts. In 2006, he was inducted into the Pro Football Hall of Fame in recognition of his coaching career. He is also widely known for the long-running Madden NFL video game series he has endorsed and fronted since 1988. Madden broadcast with Pat Summerall in the 1980s and 1990s, on CBS and later Fox. He was also the last color commentator for ABC's Monday Night Football, teaming with Al Michaels, before it moved to ESPN in 2006. His last regular role was as a commentator for NBC's Sunday Night Football, also with Michaels. During his career, he worked as the main color commentator for all four major networks. John Madden married Virginia Fields on December 26, 1959. They live in Pleasanton, California, and have two sons, Joseph and Michael. Joe played football at Brown University and Mike attended Harvard University where he started at receiver on the football team. In 1960, he became an assistant coach at Allan Hancock College in Santa Maria, and was promoted to head coach in 1962. Following the 1963 season, he was hired as a defensive assistant coach at San Diego State, where he served through 1966. During that final campaign, the Aztecs were ranked among the top small college teams in the country. While at SDSU, Madden coached under Don Coryell, whom Madden credits as being an influence on his coaching and who he feels will one day be included in the Hall of Fame. In 1976, the Raiders went 13–1 in the regular season, and escaped the first round of the playoffs with a dramatic and controversial victory over the New England Patriots. In the second round of the playoffs they defeated the Steelers for the AFC Championship. On January 9, 1977, in the first Super Bowl to match multiple Super Bowl runners up, Madden's Raiders finally captured their first Super Bowl with a convincing 32–14 win over the Minnesota Vikings. Madden's overall winning percentage including playoff games ranks second in league history. He won a Super Bowl and never had a losing season as a head coach. Madden had a winning record as a head coach against Tom Landry, Don Shula, Chuck Noll and Bud Grant who are generally regarded as the top coaches of his era. After working lower profile contests for CBS during his first two years, he was elevated to the network's top football broadcasting duo with Pat Summerall in 1981, replacing Tom Brookshier. The team of Madden and Summerall would go on to call eight Super Bowls together (five for CBS and three for Fox). On occasions in which Summerall was unavailable (during the CBS years, Summerall was normally scheduled to commentate on U.S. Open tennis tournament during the early weeks of the NFL season), Madden would team with the likes of Vin Scully and subsequently, Verne Lundquist. On their final CBS telecast together (the NFC Championship Game on January 23, 1994), Madden told Summerall that while CBS may no longer have the NFL (for the time being, as CBS would eventually regain NFL rights in 1998 by outbidding NBC for the rights to AFC telecasts), at least they have the memories. On ABC's final Monday Night Football telecast in 2005, Madden used a similar choice of words. When the Fox Network gained the rights in 1994, the pair shifted to that network with Madden reportedly making US$50 million per year. Following his appearance during Super Bowl XXXVI in February 2002, Madden left Fox to become a commentator on ABC's Monday Night Football, working with longtime play-by-play announcer Al Michaels. On April 16, 2009, Madden officially announced his retirement as an NFL broadcaster after 30 years, saying "It's time." Former Cincinnati Bengals wide receiver Cris Collinsworth was announced as his replacement. Madden now lives in Pleasanton, CA. Madden's fear of flight is well known (aviophobia). Two different theories have developed as to the cause. One theory relates to the October 29, 1960 Cal Poly football team plane crash that claimed the lives of sixteen players, the team’s student manager, and a football booster. Having graduated from Cal Poly only two years prior, Madden lost many friends in the accident. However, it is known that Madden flew up until 1979, when he had a panic attack on a flight originating in Tampa. The details, nature and extent of this panic attack are not known. Madden, however, stated once in an interview that his fears were not about turbulence, flying, or heights, but primarily claustrophobia. He also once noted that when he did fly, traveling all over the United States, it did not allow him to see anything. During his Saturday Night Live hosting appearance in the early 1980s, a short film aired depicting Madden making the journey to New York to host SNL by train. In the mid-1980s Madden was a frequent rider on Amtrak's Lake Shore Limited. However, beginning in 1987, he has traveled around the country in a customized coach-bus, which he has dubbed the Madden Cruiser. The Madden Cruiser shells are manufactured by Motor Coach Industries. The coach sponsors over the years have included Walker Advantage Muffler and Outback Steakhouse. The most recent coach, Madden's sixth, was built in 2005. Madden has never done commentary for the Pro Bowl, which was held in Hawaii during every year of his broadcasting career. Likewise, Madden has never called any preseason game held outside of North America, even if his play-by-play partner was on the telecast. The Pro Football Hall of Fame honored Madden with its Pete Rozelle Radio-Television Award in 2002. In August 2005 the Hall's Veterans' Committee selected Madden and Rayfield Wright as candidates for entry into the Hall in 2006. Madden was inducted into the Hall of Fame on August 5, 2006. Madden was placed as number two on David J. Halberstam's list of Top 50 All Time Network Television Sports Announcers by Yahoo! Sports. On August 25, 2009, Governor Arnold Schwarzenegger and Maria Shriver announced that Madden would be one of 13 California Hall of Fame inductees in The California Museum's yearlong exhibit. The induction ceremony was on December 1, 2009 in Sacramento, California. Madden does a six- to nine-minute on-air chat on KCBS radio in San Francisco with the sports and news anchors every weekday morning at 8:15 am Pacific Time, with recorded repeats throughout the day. Podcasts are available at http://sanfrancisco.cbslocal.com/tag/john-madden/ and on iTunes. In recent years Madden has appeared in a variety of radio and television commercials including Ace Hardware, Outback Steakhouse (the current corporate sponsor of the Maddencruiser—see below), Verizon Wireless, Rent-A-Center, Miller Lite, Sirius Satellite Radio and Tinactin. In particular, the Miller beer advertisements cemented Madden's image in the public eye as a bumbling but lovable personality. Madden had a brief movie role playing himself in the 1994 youth football film Little Giants and in the 2000 film The Replacements. He appeared in a 1999 episode of The Simpsons, "Sunday, Cruddy Sunday". Madden also hosted an episode of NBC's Saturday Night Live in 1982 with musical guest Jennifer Holliday. As well, Madden was featured in the Irish band U2's music video for the song "Stuck in a Moment You Can't Get Out Of". In the video, Madden is commenting on a fake football game featuring Paul Hewson as the kicker who misses a short kick to win the game. John Madden lends his voice, personality and name to the Madden NFL series of football video games, published by EA Sports/Electronic Arts since 1988. Entries in the series have consistently been best-sellers, to the extent that they have even spawned TV shows featuring competition between players of the games. Despite Madden's retirement as a broadcaster in 2009, he still continues to lend his name and provide creative input to the game. Madden has viewed the game as an educational tool on football. Even during initial planning conversations with Electronic Arts founder Trip Hawkins in 1984, Madden envisioned the program as a tool for teaching and testing plays. And during a 2012 interview, he stated that Madden NFL was "a way for people to learn the game [of football] and participate in the game at a pretty sophisticated level." ^ a b "John Madden". September 23, 2002. Archived from the original on November 22, 2009. Retrieved November 22, 2009. ^ "Madden retires from booth after 30 years". NBC Sports (NBC). April 16, 2009. Retrieved April 17, 2009. ^ "John Madden Oakland Raiders John Madden". Raidersonline.org. February 4, 2006. Retrieved October 12, 2011. ^ Fleischman, Bill (October 31, 1986). "Harvard Vs. Brown A Family Affair For Maddens". ^ Harrell, Eben (April 17, 2009). "2 Min Bio: John Madden". TIME. Retrieved April 18, 2009. ^ "More on John Madden". San Francisco Chronicle. April 17, 2009. Retrieved April 17, 2009. ^ "John Madden's enshrinement speech transcript". Retrieved November 2, 2008. ^ "money.cnn.com". money.cnn.com. February 28, 2002. Retrieved October 12, 2011. ^ 5:56 p.m. ET (April 16, 2009). "Madden retires from booth after 30 years – NFL – NBC Sports". Nbcsports.msnbc.com. Retrieved October 12, 2011. ^ "Madden's legend in NFL unmatched". SI. April 16, 2009. Retrieved May 6, 2010. ^ 4:05 p.m. ET (December 24, 2008). "Madden, Tollner recall deadly plane crash of '60 – College football – NBC Sports". Nbcsports.msnbc.com. Retrieved October 12, 2011. ^ Harvey, Hank (May 24, 1986). "Amtrak at 15: Whither Its Fortunes?". ^ Bannister, Paul (December 9, 2003). "John Madden: America's biggest commuter". Bankrate.com. Bankrate, Inc. Archived from the original on November 22, 2009. Retrieved November 22, 2009. ^ "The top 50 network TV announcers of all time". Yahoo Sports (Yahoo). January 30, 2009. Retrieved May 15, 2009. ^ "EA: Madden NFL Franchise To Continue, Contract 'Long Term' (ERTS)". Silicon Alley Insider (The Business Insider). April 16, 2009. Retrieved May 15, 2009. ^ Hruby, Patrick. "The Franchise" ESPN, 5 August 2010. ^ Markazi, Arash (2009-08-21). 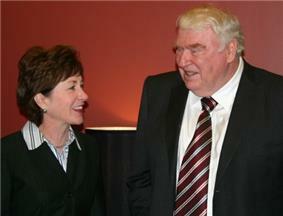 "John Madden talks retirement, video game, plans for '09 season". SI.com. Retrieved 2010-05-02. ^ Bissell, Tom (2012-01-17). and the Future of Video Game Sports"Madden NFL"Kickoff: . Grantland. Retrieved January 21, 2012.